The late Harare mayor Tony Gara who infamously once likened President Robert Mugabe to Jesus Christ, would have been proud of Zanu PF youth leader Kudzanai Chipanga if he was still alive. Gara’s name, along with that of former Zanu PF commissar Webster Shamu, always tops the list when a roll call of Mugabe’s eccentric bootlickers is made and Chipanga has gone to desperate lengths to be in that league. The politician from Manicaland has angered the Christian community by referring to Mugabe as Black Jesus and an angel. He has used the ongoing so-called youth interface rallies to prove his loyalty to the 93-year-old ruler, but religious leaders say he is now overstepping boundaries. At the first rally held in Marondera in June, Chipanga said Mugabe was God’s representative on earth. The Makoni South MP got carried away after the partisan crowd cheered him on, saying in heaven Mugabe would stand beside God, vetting people. 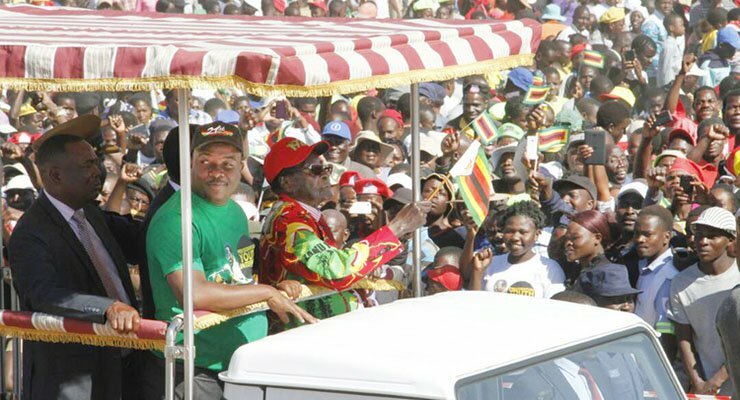 He repeated the blasphemous statements at subsequent rallies held in Lupane, Mutare and Chinhoyi. Christian leaders in the country are not happy and some believe Mugabe has a responsibility to rein in the excitable politician. Reverend Useni Sibanda, the Zimbabwe Christian Alliance executive director said although Chipanga’s behaviour was to be expected from politicians, it was worrying. “The problem is that in the political space, some people end up taking political figures to the level of God,” he said. Sibanda added: “During the New Testament era, Christians were persecuted because they couldn’t raise their leaders to the level of God. This is idolatry and it is against the teachings of the church. He said only Mugabe can put a stop to the blasphemy. “Leaders themselves should restrain their followers. Humans have a beginning and end, unlike God,” Sibanda said. “No one should compete with God and it takes servant leadership to see that. Retired Anglican Bishop Sebastian Bakare said Mugabe as a Catholic must be worried about Chipanga’s statements. “Only President Mugabe can say to Chipanga ‘please shut up’. As a Catholic, he must know better,” he said. “This is a result of hero-worshiping. This is blasphemous and Mugabe should say no to that. “He [Chipanga] is not the first person to do that. At one point Tony Gara did the same, claiming Mugabe is more than a human figure. Rejoice Ngwenya, a political commentator said Chipanga should be censured. “Nobel peace prize winning drooling! If Zimbabwe was a fundamentalist Islamic state, the boy would be lynched. I think Christians should be on a beeline of protest to whichever graveyard Chipanga resides,” he said. “No amount of praise-singing will change the fact that Mugabe is a habitual dictator who cheats his way into State House. MDC-T spokesperson Obert Gutu said Chipanga needed help. “Chipanga is mad. He is of unsound mind. He needs help. The young man desperately needs our prayers,” he said. However, Zanu PF insiders believe Chipanga is desperate to prove his loyalty to Mugabe after he was on various occasions caught on the wrong side of Zanu PF politics. The youthful politician has survived many political battles. In 2013 he was almost fired from the ruling party after he was identified as one of former vice-president Joice Mujuru’s supporters. He was viewed as former Zanu PF secretary for administration Didymus Mutasa’s blue-eyed boy. Chipanga shocked many when he abandoned Mujuru’s faction as the infighting in the ruling party reached a crescendo. He became a favourite of Mugabe and was given the powerful youth secretary post after the incumbent Pupurai Togarepi was fired in 2015.